Samoa-born brothers Sam, Joe, Jesse, John, and James-collectively known as The Katinas-do nothing less than set the standard for five individuals singing with one unshakeable voice. With a vocal blend honed by siblings singing since birth, The Katinas utilize their synergistic bonds to stretch pop music beyond any of its present borders. The group's artistic vision has always been bold, but never has it all come together the way it has on Roots. Roots seamlessly sews together such sleek sounds as classic Motown, urban hip-hop, neo-soul, and islands-influenced pop. With the same musical heritage, the brothers maintain a clear artistic vision that gives them a singular voice as natural as their family ties. "We can honestly say that everything we did on Roots was intentional," says Joe, who also plays drums in the group. "In the past we sorted through all the different styles that we like, but with Roots we nailed our style with purpose." "The album has such a strong concentration on harmonies," explains Jesse. "Even as kids, our dad would only let us play instruments if we could sing while we played." Adds Sam jokingly, "And that is really hard to do when you're playing the saxophone." 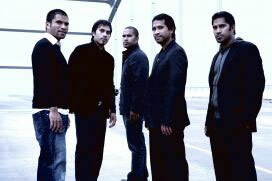 The Katinas also distinguish themselves from other vocal groups by playing instruments. In the past, the group often worked with producers that doubled as programmers, which took away from their live performance feel, but Roots brilliantly celebrates the brothers' change to making live instrumentation an integral part of their recordings. The Katinas co-produced the album with Bryan Lenox (Michael W. Smith), Kene "Ghost" Bell (tobyMac), Pete Kipley (Mercy Me), and Robert "Aurlem" Marvin (Stacie Orrico). The brothers crafted upbeat tracks like "Freedom" and "Are You Ready" that rev up the rock guitars for an undeniable energy and attitude. Likewise, "Movin'" and "Hey World" marry the live instrumentation with edgy urban programming for a fierce pop assault that conquers the best of both worlds. Yet Roots utilizes more than guitar, bass, and drums for its electrifying energy. Tommy Sims lends guest acoustic guitars, keyboards, and vocals to "Faithfully," Sam plays the Clav on "One Moment," and several tracks, such as the angelic "Changed," feature spectacular string arrangements. Complementing their real sound, The Katinas also address real issues. A prominent example would be the cut "Still In Love." Highlighted by a guest appearance from Amy Grant, the song conveys the power of enduring love, such as the bond the five brothers still feel for their mother who lost her battle with breast cancer on April 21, 1988. "Up to this day, we still write a lot of songs about our mother," says James, who also plays bass. "As we've grown into young men and even fathers, we find ourselves teaching our children everything we learned from our mom. She's still the inspiration to a lot of the lyrics even 15 years later." Though born in American Samoa, The Katinas spent much of their youth in the north San Diego suburb of Oceanside where their father served in the Marines at Camp Pendleton. Following the completion of his military tenure, Moses Katina moved the family back to the islands to help the local churches as a music director and eventually a pastor. As a music minister, their father always wanted a band, and one day he saw the potential in the little ones all grabbing at his pant leg. The brothers eventually became the praise and worship group at their dad's church, and it didn't take long until the greater potential was seen. "Even back in Oceanside," recalls Sam, who also tackles piano duties, "we would set up our mom's pots and pans and perform for people in the living room. Doing music always felt like our destiny." As a result of their mother's illness, the family moved to the state of Washington in 1987, which remained the group's home base until 1993. Both in Samoa and Washington, The Katinas released independent albums before signing with Maranatha imprint Arcade Records in 1991 to release their national debut. Relocating to Nashville two years later, The Katinas started working with BeBe Winans and struck a production deal with Arista Records. Though incredible growth came during this period, there were also downtimes in which the group worked day jobs instead of doing music. In 1996, The Katinas started touring again, and they found a new label home with Gotee Records the year after. Their self-titled Gotee debut sold over 125,000 copies, and 2001's Destiny garnered even more critical acclaim. The group then released the Dove Award nominated live worship album, Lifestyle, in 2002. Roots promises to take The Katinas to the top of the pop pinnacle, especially considering how far they've come already. To date, the brothers claim eight Dove Award nominations, including a Dove Award win for their contribution to 1999's compilation, Exodus. In addition, The Katinas have landed two ASCAP Awards, and four #1 radio hits. Likewise, they've shared stages with Quincy Jones, Gladys Knight, Kenny Rogers, Michael McDonald, Bill Gaither, Andrae Crouch, and Vince Gill, and appeared on such nationally televised events as the Billy Graham Crusade, CMT's September 11 Memorial, Monday Night Football, and the sports fan's dream, singing at the Garden before a Knicks game. The Katinas have also become a favorite with concert audiences across the country, averaging nearly 200 performances annually for the past eight years. They have toured with CeCe Winans, joined Michael W. Smith's 2000 "Christmastime Tour" and have been featured on three of Amy Grant's popular Christmas tours. In the fall of 2002, The Katinas headlined their first tour, and in late 2003 the group will share their new music with audiences across the country, along with special guest Joy Williams. The Katinas will also be featured on the 2003 "Christmastime Tour" with Michael W. Smith and special guests Point of Grace. Roots, clearly their best album yet, will usher in a new era for The Katinas, and without question, each member wouldn't want to take these steps with anyone other than this family. "By being brothers and doing so many albums already," says John, "we truly draw from each other's victories and valleys. The lyrics speak to the power of God, but they also speak to the power of love and unity between brothers."